Athletes of the world gathered as backing dancers for Pet Shop Boys’ outrageous appearance at the Olympic Games closing ceremony. Those outfits, including tall conical hats complete with visor, cut a dash as the chaps did an ironic lap of honour poised on the back of luminous fantasy origami rickshaws. How might they follow that? Difficult, you might think. But the duo which first popped up on our radar in the mid-1980s with the hit West End Girls have never been short of ideas. Or memorable tunes. At least not since Neil Tennant switched for interviewing pop stars for Smash Hits to becoming one, alongside keyboard boffin Chris Lowe. 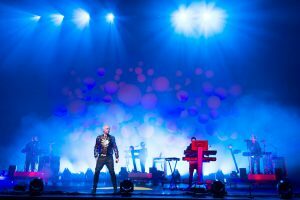 Pet Shop Boys have always been at their best when forensically dissecting grief under the glare of the disco mirrorball. Elysium, mythical home of dead heroes and the blessed, carries huge promise as the title of the duo’s 11th studio album. They don’t disappoint. Leaving, the opening track, observes, ‘Our love is dead but the dead don’t go away… they’re with us everyday.’ Clearly, there’s an elevated pop consciousness at play here. Stylistically and sonically, across these 12 new tracks, they’ve succeeded in the intensely difficult task of simultaneously sounding fresh and new while remaining reassuringly familiar. This is due in large part to recording, for the first time, in Los Angeles where producer Andrew Dawson, fresh from working with Kanye West, invested a luxurious sense of spatial dynamic in songs that range from the wry self-deprecatory Your Early Stuff (‘Those old videos look pretty funny. What’s in it for you now? Need the money?’) to the optimistic operatic anthem Hold On (‘..there’s got to be a future or the world will end today..’).